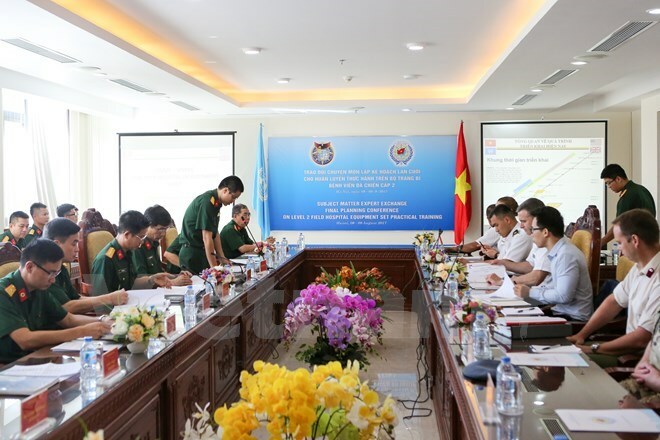 Hanoi (VNA) – The Vietnam Peacekeeping Centre (VPC) organised on August 8 a subject-matter expert exchange to make final planning on level-2 field hospital equipment practical training. The two-day exchange is attended by experts from military hospitals of the US and the UK, along with officers of the VPC and the Ministry of National Defence of Vietnam. It aims to share expertise and experience between relevant parties so as to make a plan on practical training with level-2 field hospital equipment. That will help Vietnam stand ready to send its force to UN peacekeeping missions when requested. VPC Director Colonel Hoang Kim Phung thanked the US and UK experts for their assistance and affirmed the importance of experience sharing to ensure practical training with level-2 field hospital equipment. At the exchange, participants were briefed about Vietnam’s preparations for the level-2 field hospital, the UK’s deployment of a field hospital at the UN peacekeeping mission in South Sudan, and the goals of the level-two field hospital equipment practical training. They also worked on logistics and administration works for the practical training, simulations to be used during the training, and the operation of the level-2 field hospital at the practical training area.